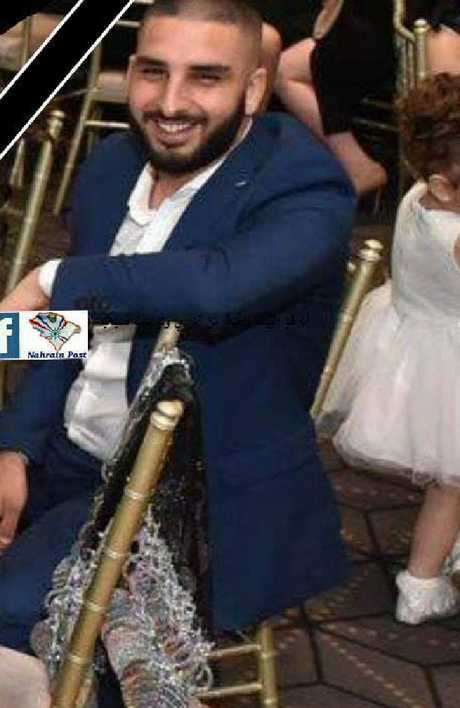 SYDNEY police were on high alert at the funeral of a young western Sydney man who was fatally stabbed to death last Friday. 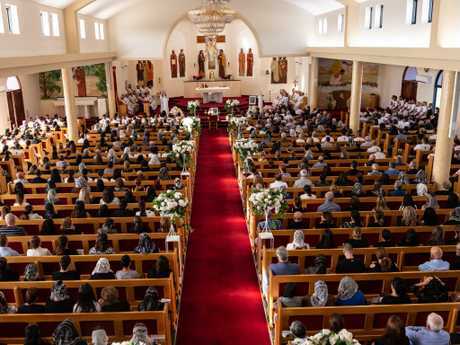 The funeral for Alfredo Isho took place at St. Thomas Assyrian Catholic Church this morning, drawing hundreds of mourning friends and family still shocked at the 20-year-old's sudden death. Approximately 10 police patrol cars, a public order and riot squad car, undercover police cars and police SUVs surveilled the area from before 8.30am until after the funeral ended. One police car stationed itself at a roundabout at the entrance to the street with an officer in the back seat seemingly taking photos of cars as they drove past. One officer said the high number of police was simply for traffic control, before saying they were making sure their presence was known. Hundreds turned out to the funeral of Mr Isho, with neighbours saying it was the biggest funeral they had ever seen at the church. Mourners gathered at the funeral of Alfredo Isho. Picture: Monique Harmer. 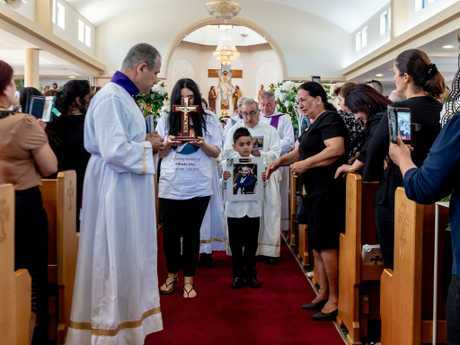 Many wore white at Alfredo's mother's request, and personalised shirts were given out with his smiling face on the front and a poem on the back. "A son to two, a beloved nephew, a brother to many, who left hearts blue. "Missing you more and more each day, to see you on the other side we pray." Mourners packed the pews, with many standing around the sides of the church and spilling out to the entrance of the church. Mourners wore T-shirts with the image of Alfredo Isho. Picture: Monique Harmer. 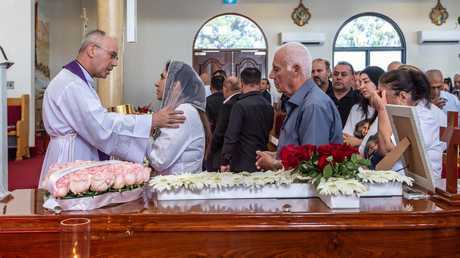 A procession of priests led the traditional Assyrian funeral, with most of the service carried out in the local dialect. In the one part of the service spoken in English, an impassioned priest implored his congregation not to seek revenge. "No one can accept this. It is a criminal act. 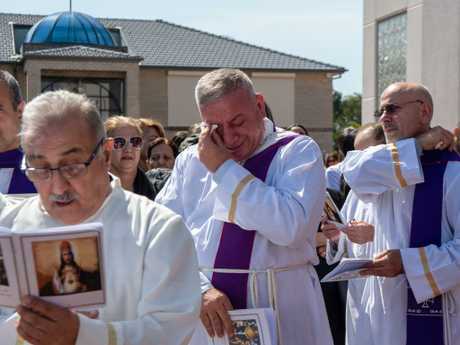 St. Thomas the Apostle Chaldean Cathedral in Bossley Park was packed for the funeral. Picture: Monique Harmer. "Justice will go its process and we will wait for that. "We are human, but we believe in Jesus Christ, so we don't take revenge. "No, it is not allowed. It is not accepted. "Jesus does not allow revenge." Several priests spoke at the funeral. Picture: Monique Harmer. Police and the riot squad continued to patrol the street continuously throughout the service. One parked in the driveway of a house across the street from the church facing forward. As the service ended, the procession carried Alfredo in his coffin to the waiting black hearse. Family played instruments and sang as they carried him down the aisle, down the steps and into the back of the car. 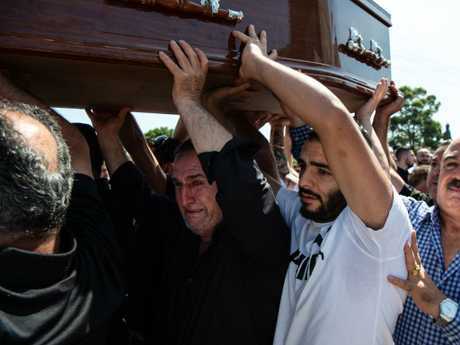 Mourners carried the coffin of Alfredo Isho. Picture: Monique Harmer. Attendees swarmed to surround the car as it left, many saying goodbye for the last time. Grieving women doubled over in agony and teary men consoled each other with a hug or a touch of the hand. Gradually the hundreds of people who came to farewell Alfredo dispersed and cars sat bumper to bumper until the congestion eased. Alfredo was fatally stabbed on January 11 as he waited for a haircut in Bossley Park. His alleged killer, an 18-year-old male, was arrested shortly after. Three others have also been charge in relation to the murder, aged 17, 18 and 22. They have all been refused bail and face court in the coming weeks.